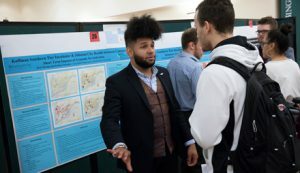 Research Days will run from April 8-13 this year as Binghamton students, faculty and staff gather to celebrate research, scholarship and creative activities. Highlights of the weeklong program include a talk by NPR science reporter Richard Harris, campus-wide student poster sessions featuring more than 175 projects, the opening of a new Art of Science exhibit and a two-day conference focused on human rights research. The schedule includes the first-ever Ignite session in upstate New York, in which graduate students and post-docs will tell a rapid-fire story about their research in just five minutes. There will also be lab tours, lectures, workshops and other programs. “Research Days gives people from all different parts of campus a chance to see what their colleagues are working on and to appreciate the depth and diversity of scholarship at Binghamton,” said Valerie Imbruce, who chairs the committee that organizes the program. The theme for this year, the eighth-annual installment of Research Days, is Rethinking Research, and that will be the topic of an undergraduate panel at 12:45 p.m. April 12 in UU-111. The students will reflect on what they expected when they got involved in research and what they found, both personally and professionally. “For students, Research Days opens opportunities to present their work, maybe for the first time, and to begin to feel part of a community of people engaged in the creation of knowledge,” said Imbruce, who is director of the Undergraduate Research Center and the Office of External Scholarships, Fellowships and Awards. In addition to her office, Research Days are organized and sponsored by the Division of Academic Affairs, Center for Civic Engagement, College of Community and Public Affairs, Decker School of Nursing, Division of Research, The Graduate School, Institute for Advanced Studies in the Humanities, Louis Stokes Alliance for Minority Participation and McNair Scholars Program. The Writing Initiative’s How I Write series presents David Sloan Wilson, SUNY distinguished professor of biology and anthropology and president of the Evolution Institute, on the occasion of the publication of his new book, “This View of Life” (Pantheon). Five-minute research talks by graduate students and postdocs. An exhibit of entries from Binghamton University’s third-annual Art of Science competition. Light refreshments will be served. Undergraduate and graduate students from all academic disciplines showcase their research. This SUNY Conversations in the Disciplines event will examine the moral parameters of human rights research, literary and historical dimensions of human rights, and the role of quantitative and technological methods of research. For a full schedule, visit https://research.binghamton.edu/events/researchdays/submittedevents.php.